I picked up Red Queen at Yallfest. It’s one of the books I was most excited to read. I had heard so many good things and there’s just a general thrilling buzz surrounding it. Naturally, I had super high expectations for it as a result. So when I read it, and wasn’t really that into it, I was surprised. I mean, I like it enough, but it wasn’t the visceral, full-body OHMYGOD that it had been puffed up to be. I liked the ending a lot more than the book as a whole. I think the ending must be what people are talking about when they describe how awesome it is. It really surprised me in the best ways, it was a total twist of the experience. But I want to get back to the parts I didn’t totally love. It just felt like The Hunger Games, but everything was 25 percent different. So instead of the Capital and the Districts, there are the Reds and the Silvers. And instead of having a public Hunger Games, Mare gets thrown into this private war of survival. There’s the fact that she’s torn between two dudes. These are trends in YA that we see again and again. I’m not necessarily mad about these recurring themes—they’re recurring because they work so well—but it just wasn’t what I was expecting from this book. To its credit, these are all taken in radically new directions—which is what needs to happen when you’re using these constructs—but the storylines and characters, with a couple exceptions, don’t show their complications until the end of the story. I wish I had seen a bit more of that earlier. That was a choice, though, to make the readers think they’ve got everything figured out and then at the last minute, yank the rug out from under them. I get it, and the ending makes it work, but I wish the build-up had a little bit more going on. I also felt like the book did a lot of over-explaining. I understand the inclination to spell thoughts and feelings out. You want to make sure you’re understood, but one of the best parts of reading is figuring those things out for yourself. It’s like gathering intel from weird looks and subtle dialogue. That being said, I liked the book for the most part. The characters are intriguing and diverse and I want to know more about the society in which they live. It definitely gripped me, just maybe not as much as I had hoped it would. Are there things I wish were done differently? Yes, but it was still a fun read and I’ll probably read the next one! I have wanted to go to Yallfest since 2010, when it began. It’s been on my list and every November, when I inevitably couldn’t go, I would stalk Twitter and Instagram and all of my favorite blogs for updates of the coolest day of the year. It got to the point where I was actually pained that I wasn’t there. Those were my people, that was my life! How could I not be there?? But there was always a reason, school, lack of funds, just general universe-is-against-you things. And that was how it was until this year. This year, my first year of “adulthood,” if you wanted to call it that (I, for the record, do not). This year, I went to Yallfest. Too much hype? Absolutely not. Let’s recap. I went with my mom, and we landed in Charleston on Friday morning. The festivities didn’t start until later in the day so we had some time to kill. We grabbed lunch from a place called Smoke and I had the most exquisite sandwich on the face of this planet. A bunch of authors on stage at the YA Smackdown! Libba Bray’s band Tiger Beat! After that, we drove around the city in our rental Prius, which is a confusing spaceship of a vehicle. Charleston feels unchanged by the 21st century. All the houses were built in the same style, with sweeping front porches and leaning walls. On what felt like every street corner, there was a historical plaque describing the history of the “War Between the States” or honoring the efforts of a fallen Confederate soldier. The city is peppered with art galleries, more than I’ve ever seen in one place and the coffee game is on point. The contrariness of the whole place is impossible to miss. Part of you is like, “Um…the ‘War Between the States’? ?” while another part of you is like, “How does anyone ever leave this beautiful place and their beautiful sandwiches? ?” It was surreal. Yallcrawl, a “parade” of book signings, took place that evening in several locally-owned stores and museums and venues around town. I went to two, where I met Victoria Aveyard, who wrote “Red Queen,” and Scott Westerfeld, who HELLO wrote “Uglies” and “Leviathan”and other great books. Victoria was so cool and kind and Scott Westerfeld was a mensch, totally funny and friendly. The next day was when the fest really began. It opened with a panel from R.L. Stine and Richelle Mead, and it was hilarious. They talked about how they got their start and how they’ve kept up their momentums. From then on, I went to panels held by authors discussing professional and personal jealousy, writing emotional scenes, the significance of sexuality and gender in YA and more. I also went to this killer panel about getting your start in the publishing industry, which was held by a couple prominent editors and agents, where I received some really valuable advice. I saw and met a ton of cool authors, some of my own personal heroes, including Daniel Handler, Meg Cabot, Marie Lu, Libba Bray, Zac Brewer, Margaret Stohl, Aaron Hartzler, Sabaa Tahir and GAYLE FORMAN! Awe-struck and speechless by Gayle Forman, because she is such a great and meaningful author, and she’s also a feminist badass with a lot of grievances and a bunch of punches to throw. She’s awesome. It’s like she says what I wanted to say, but didn’t know how to put into words. It all ended in YA Smackdown, featuring Libba Bray’s band Tiger Beat. All of the authors came together on stage and played games and goofed off. Libba Bray played us out with her quirky, throwback band. It was a blast. Margaret Stohl opened the fest by saying that it was always the best day of the year. And I see why. I’m very conscious that the YA community is unlike many others. We’re all together, geeking out over our favorite stories, and just generally loving each other. Hate isn’t invited, because there’s just no room for it. People kept saying we’re a tribe, one founded on mutual admiration and a love of words. I could feel it all day, in the readers I spoke with while waiting in lines, in the authors who put their hearts into their books and to the editors and agents who pull it all together. I’m thankful to have weaseled my way in to this kooky place, and I plan on staying here for a while. Until next year, Yallfest! You really are the best day of the year. That pretty much sums up the book. My work here is done. Bye. 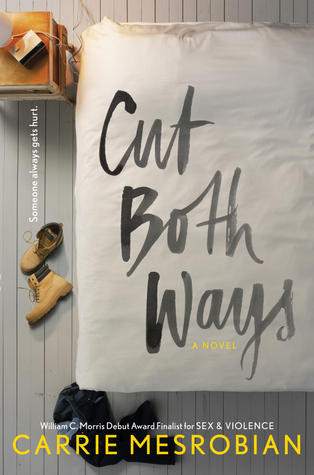 No but really, “Cut Both Ways” is about a boy who exists in a void. He’s caught between places. Between his mother and father’s house. Between high school and whatever’s next. Between childhood and adulthood. Between Brandy and Angus. I’m glad to know that these books are being written. Books that feature people who are categorically different from me. I would have been hard-pressed to find a YA book whose main character was a boy—let alone a boy struggling to define his sexuality—on the Staff Recommended shelf when I was 14. We need diverse books! I had these books when I was younger because they would have broadened my world view in a way that I’m just now doing. Will Caynes is an excellent narrator. He is dynamic and simultaneously stagnant. And he has a clear idea of who he is in terms of pretty much everything, except his sexuality. I loved being in his head, it felt inarguably real to me. Almost all of the book is his thoughts, interspersed with dialogue and small visual details. It’s the kind of setup where, for it to work, you have to enjoy his mind or sympathize with his struggle. Mesrobian writes in such an affecting way that I had no choice but to feel for Will. Every step of the way, I was on his side. This can be problematic at times, like when he realizes he’s cheating on both Brandy and Angus. Which is messed up, right? Cheating is always messed up, but the difference here is that Will knows this and hates himself for it and as a reader, I was like, dude, cut yourself a break, your situation is more complicated than that. You’re trying to figure it out. I’m even sitting here, and writing that sentence excusing his cheating feels insane to me, but I do believe it for him. That’s just how Mesrobian’s writing works in this book, and it’s really compelling. I really enjoyed the secondary characters, Brandy, Angus, and his parents, as well. Part of what works about all of them is that they are each essentially good people, even his father, who definitely has some stuff to sort through. They have both good and bad qualities, which complicates things. It would be easier for everyone if they were all complete assholes, but they’re not. That’s why it’s hard for Will to choose one person to be with and one parent to agree with. It’s a great support system for the book, and a kind of rickety one for Will. I like how carefully Mesrobian treats Will’s confusion. As she says in her author’s note, she never once mentions in the book that Will might be bi, which she says is an intentional example of bisexual erasure (“the willful disbelief that people can be attracted to both genders” (342)). And that’s important because I think it’s probably reflective of many young people’s similar journeys of self-discovery and identification. She says she doesn’t know what Will’s sexuality is and that she thinks it’s less important for her to identify him than it is for her reader’s to contemplate what he is. So I’m like YAAASS, this is great, this is necessary. The only part of this book that makes me weary is the ending. I’ll just say this — it’s abrupt. When I first finished it, I was pissed. I was like, really. Really, this is how it ends? But with the space of a few days, I think I might like how open-ended it is, but the jury’s still out on that one. What do you think? Read it and let me know, peeps. You all know that I’m a sucker for Huntley Fitzpatrick. I impatiently awaited My Life Next Door and when it came out, I couldn’t deal. The same goes for What I Thought Was True and The Boy Most Likely To. I think she has an ability to taper down and find the root of people’s desires and write about them in appealingly realistic ways. I am really afraid of spoiling this book, because it achieves what most contemporary novels don’t—it has crazy cliffhangers! SO I have to be vague, and I apologize. What I like most about The Boy Most Likely To is that it brings up questions about myself that I hadn’t thought to ask. Like, what would I do if I messed up this big? Or, how would I react if the person I wanted to be with had this unexpected, implacable baggage? WHAT WOULD I DO? But it also seeks to answer smaller, more universal questions that we all have to ask at some point. Who is worth forgiving? At what point is someone so far gone that they can’t be changed? Who’s worth fighting for? Am I worth fighting for? And I like that about Fitzpatrick’s books. She doesn’t shy away from what’s heavy. She writes for a younger audience, but she doesn’t discredit them by ignoring broad, sweeping topics. She gets real, you guys. But she peppers her ~realness~ with humor, often in the forms of funny little kids, which is such an effective element, particularly in this book. I like almost everything about this book. I think the characters are real, complex and flawed and I enjoyed re-entering the world of the Garretts that was established in My Life Next Door. It’s almost like a sequel, but with different leading characters and—dare I say it? A better story. I think Fitzpatrick’s plot works because she takes a storyline that you might think is a cliché, but she flips it on its head and makes it new. I think the same can be said of her other books as well. The one aspect of her book that I’m not on board with is the way that some of her characters occasionally speak. Tim, in particular, nicknames almost every person he meets. I think that was Fitzpatrick’s attempt to make Tim feel 17 and young and flip, but I wasn’t convinced. I don’t think immediately nicknaming people comes naturally. I could see him giving a couple key characters nicknames out of fondness and after some time, but not everyone. It was a bit exhausting. 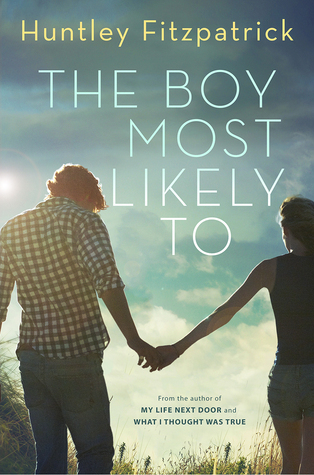 But other than that, I truly adored reading The Boy Most Likely To. Fitzpatrick crafted a deeply consuming story with characters I feel like I know. She gives girls an awesome role model in Alice and shows what certain sacrifices may be worth making. She’s finding my generation’s stories and she’s unabashedly flexing that for the world. We need books like this, ones that will give credit where credit’s due, and tell the stories we didn’t know we needed to be told. I don’t know if that really sums up my feeling toward The Boy Most Likely To, so I’ll end it with this: The book just worked for me. It isn’t perfect and there are definitely parts that I would change, but the heart of it is just what I wanted. I feel like it understands me and I understand it, and that’s what we all want from a good book, right? Maggie Steifvater, I’m really ashamed that this is the first book of yours I’ve read. Because I am undone by The Scorpio Races. Maggie Steifvater is one of those names in YA that everyone knows and has read, kind of like Michelle Hodkin with the Mara Dyer series (my heart). I’ve known about her for ages, but I’ve never read any of her books, mostly because fantasy novels tend to fall to the bottom of my to-read pile. I consistently gravitate toward contemporary real-life novels and I’m not sure why. That mystery is especially unsolvable when I read a good fantasy novel and cannot deal for the rest of the month because I’m still reeling (think: Graceling series, I am still not okay). So, Steifvater’s books always drifted out of my focus. But when I was at a bookstore last week, I saw it and thought I might as well give it a try. I AM SUCH A FOOL. 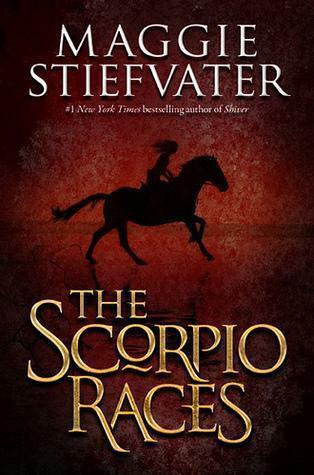 The Scorpio Races is unreal; it is so excellent that I am physically kicking myself for waiting so long to read it. First off, I want to talk about the setting. It’s a fantasy novel, and Steifvater said in her Printz Honor acceptance speech that with The Scorpio Races, she wanted it to be a “book about a world.” However, creating an entire Game-of-Thrones-esque world, complete with languages, currencies, maps, etc. is daunting so the actual story can often get lost in the noise. She chose to create a world seemingly within our actual world, with an America as we know it, but also with magic. And she makes it real—visceral to the point of feeling tangible—by using distinct, yet minute, details. Details about the smells of Thisby (the name of the island where this is set), the sounds of the ocean, and the tactility of the horses and the capaill uisce, the mythical water horses that race in the Scorpio Races. There’s also a motif of traditional Thisby foods interwoven into the novel, which a palpable dimension to the world and seamlessly rounds it out. It feels real because it is real because she made it real. Yaaaasss. That’s just a few sentences and I know you already have a good sense of who she is and what she stands for. Isn’t that so good? That’s how Steifvater develops all of the main characters in this book, and it’s absolutely riveting. The last thing I want to talk about is the love story. From the first time Puck and Sean Kendrick meet, you know—and, more importantly, they seem to know—that they are going to be together and that’s what’s so startling. The suspense isn’t in the mystery, it’s in their individual personal journeys. For Puck, that means saving her childhood home. For Sean, that means buying his freedom, in a sense. Their relationship is a compulsory side effect. By shifting the readers focus away from wondering if they will ever get together and toward the races and their growing loyalty to each other, Steifvater makes her story more enticing and reflective of what growing close to someone really looks like . Seeing the priorities of two rather stubborn and passionate characters shift is intense and inspiring and yo, I’m not embarrassed to say I cried about it. If you couldn’t tell, I love this book so so much. UGH. That personification though! You guys feel? Tell me about it. 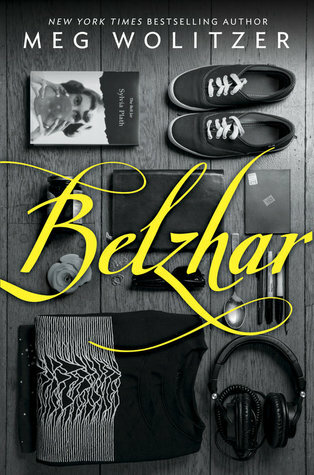 Meg Wolitzer’s young adult novel Belzhar has been poised at the top of my TBR pile since its release this time last year. But I hesitated. The summary is vague, I’m not that into Sylvia Plath (though since reading this book I might be). And, I have a hard time buying hardcover books—the paperback version isn’t out yet—because my name isn’t Colette MoneyBags Whitney. Let’s face it, hardcover books require the blood of your best friend’s first born. And I’m not into that. Also, my best friend doesn’t have any kids. But then someone bought it for me. So no innocent blood needed. 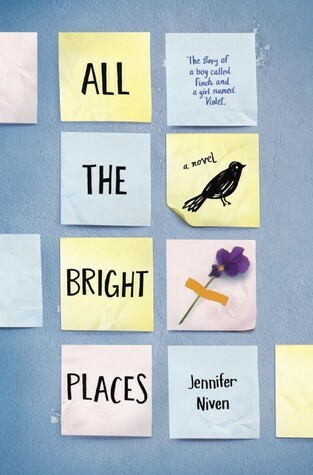 When I finished the book, my first thought was that it really reminded me of We Were Liars. You know how that book is told out of order and is pretty twisted and suspenseful? Well, Belzhar is basically We Were Liars minus the really twisted aspects, plus excellent characterization and a better story overall (imho). The premise is that this girl, Jam, gets sent to a school for grieving teens because her boyfriend died and she doesn’t know how to deal. So she goes to this school, gets placed in a special English class for which she and her classmates have to write in journals. It’s just that those journals aren’t normal; they transport the teenagers to an alternate reality, one in which their individual tragedies cease to exist. But when the glory of the journals transforms into something dark and strange, they’re each confronted with a choice. I like this book for a lot of reasons. I think it’s an original story with ties to reality and to the past, which always makes a story richer and gives it permanence. I like how Wolitzer interweaves a fantastical idea—that of an alternate reality—with the cold, devastating truths of mortality and betrayal. In that way, an overdone story (dead boyfriend, divorced parents, etc.) becomes new and fresh and alive. It’s cool, it’s like a contemporary fantasy/reality fiction hybrid (again, there is probably a word for this and I need someone to please tell me). I also think Wolitzer must have had a great time writing it. Some of the best books, the books that break your heart and stay with you, are those that begin or culminate in some kind of tragedy. Think Harry Potter, Graceling, any John Green book, The Boy Next Door, etc. And in Belzhar, Wolitzer gets to write a different, crashing tragedy for each character. That must be thrilling when you get it right, when you really nail a sad story and you know it’s going to get genuine reactions out of people. That has to be a great feeling. Anyways, I really enjoyed reading Belzhar. I think it was thoughtful and respectful of the trauma that some teenagers unfortunately experience. There’s a weird thing that sometimes happens when teenagers get emotional or get sad or get depressed. Adults tend to disregard it, or try to minimize their suffering, which is totally not fair because when you’re a teenager, the smallest bad thing can be devastating and that’s okay. I think you’re allowed to be a little irrational at that age and I don’t think that occasional irrationality gives anyone the right to make light of truly, inarguably tragic things when they inevitably do happen. I think Wolitzer understands that and through Belzhar, starts a new dialogue about how teenagers move through suffering. And how they make it out.